From jingle bells to silver bells to the ornaments hanging from the door, we're reminded of Christmas and family consonantly. 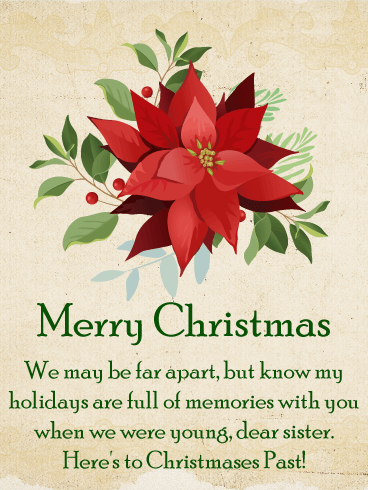 This year, reach out to your brother and tell him "Merry Christmas". Say you miss him, say you love him, say you wish he could be with you this year. Christmas is for family, be it in person or in spirit. 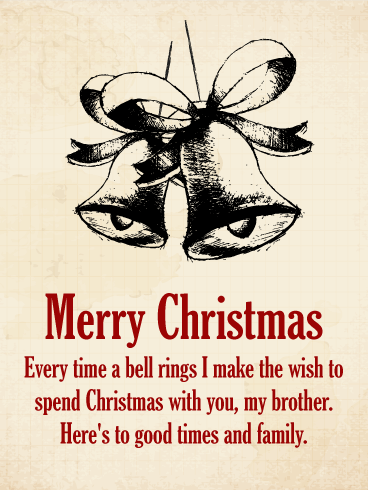 Merry Christmas - Every time a bell rings I make the wish to spend Christmas with you, my brother. Here's to good times and family. There are few things that get on our nerves more than siblings. And yet, we'll do anything for them. So this Christmas, share your love with your brother and let him know how important he is to you. Despite the pokes and prods, the noogies and digs, you love each other. 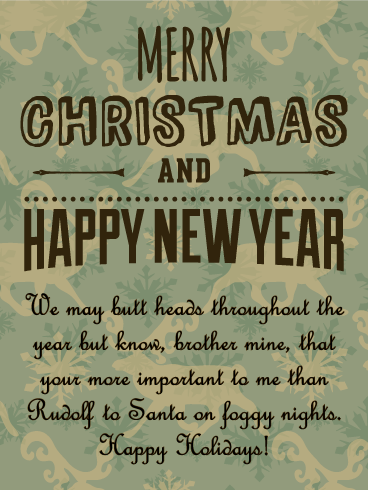 Tell your brother that this Christmas with this wonderful card. 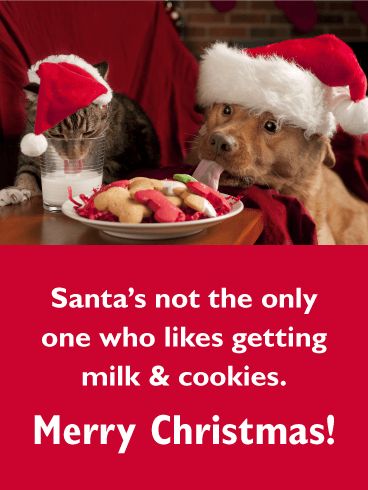 The magic of Santa Claus is that he can grant any Christmas wish. From the perfect toy to the chance to see far away loved ones, there's nothing Santa and the magic of Christmas can't deliver. Jump start a wish with this starry night Christmas card. Tis the season for friends and family! 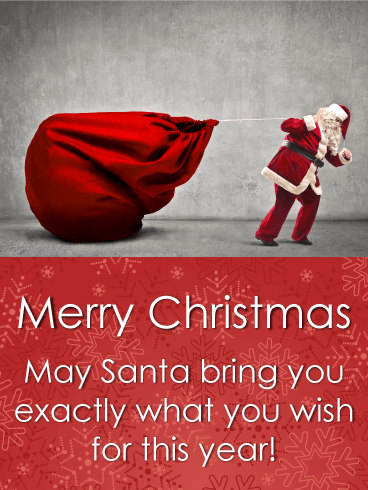 Send a Christmas wish full of so much jolly cheer Santa Claus himself would be jealous. With smiles and laughter, and a little bit of winter majesty, nothing can beat Christmas in terms of magic. Pass it all along with wishes for cheer to everyone you know! It's hard to resist the urge to turn your head when a nice car drives by. You've teased your brother about it, joked about getting him a car for Christmas. Well here's your chance! 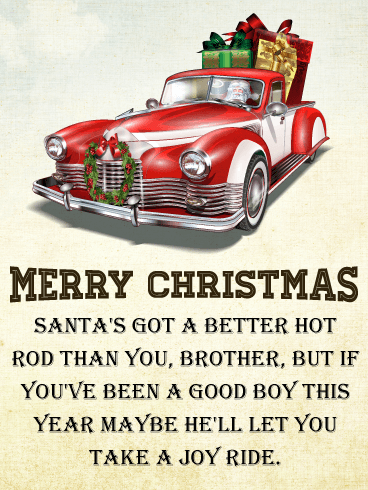 A quick peek at Santa's sleigh, eh, hot rod, will make your brother's Christmas! 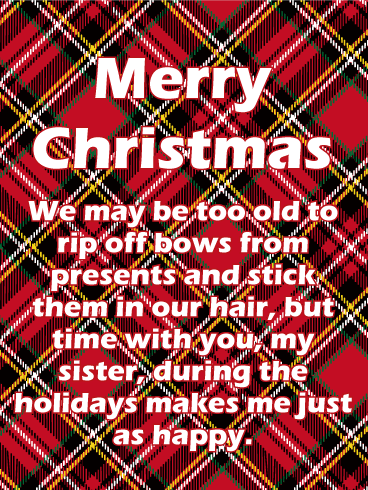 Let him know you're always looking out for his interests with this brotherly Christmas card. 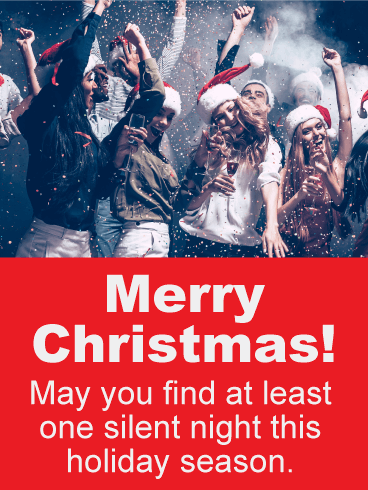 Christmas is a time of beauty and love, but it's also a time to party! 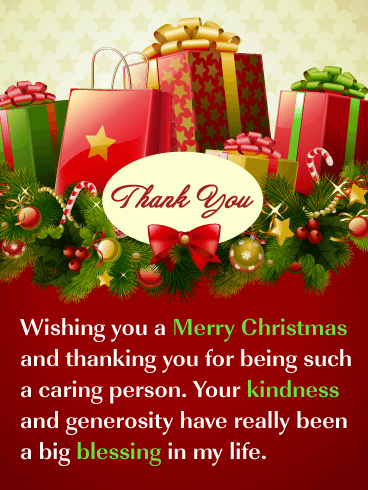 Send a Christmas wish to the active friends or co-worker, allowing them to enjoy the season as much as the rest of us. Christmas is a time for friends and family, and celebration. 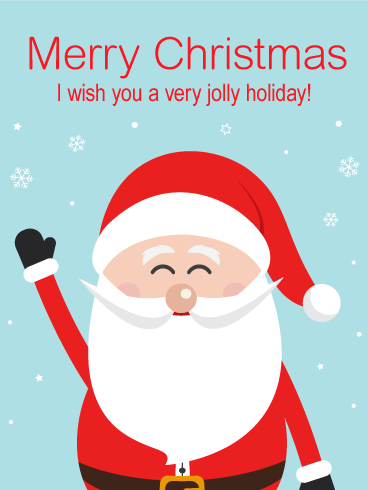 Wish everyone a Merry Christmas! Plaid pajamas and Santa presents under the tree, coupled with sleepy parents clutching coffee fill the Christmases of childhood. Now that you're grown and are creating new memories for the next generation, let your sister know that this Christmas is built off of the ones you shared with her. 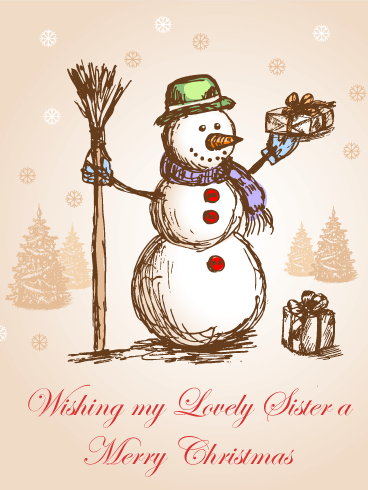 Dedicate this Christmas to your sister with this card. Let your sister know how close she is to your heart this Christmas with this beautiful poinsettia. A traditional Christmas flower, it blooms in winter just like you and your sister's sudden interest in being good on December 1st. As the Christmas Spirit grows this year, let your sister know that you wish her the merriest of holidays and that she'll always deserve a Santa gift in your book. 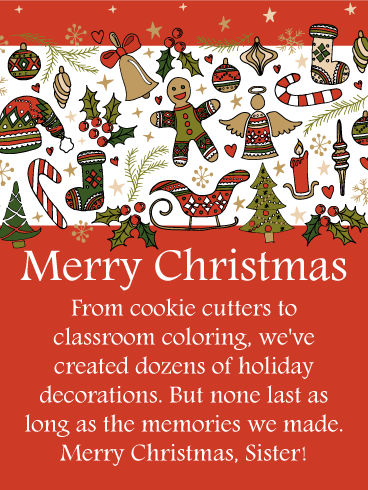 As kids, you and your sister made Christmas cookies, handprint reindeer, and pipe cleaner candy canes. And while such things might be falling apart, the memories of their creation and seeing them hung every year tie sisters together. 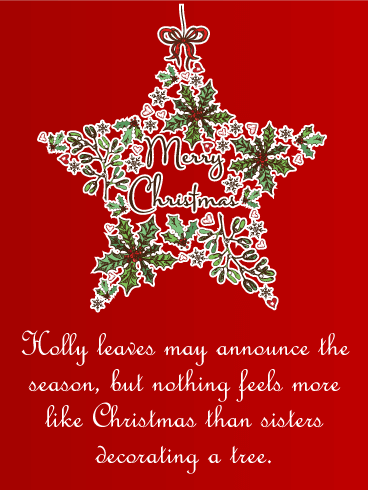 Continue the trend with this Christmas card, jumpstarting new sisterly Christmas memories to fill the upcoming years.